Will new voter ID laws swing the U.S. election? With polls continuing to suggest a presidential election too close to call, attention has focused on what some critics refer to as voter suppression tactics and whether they could have a significant effect on such a tight race. As with most election years, there have been regular media reports of such things as destruction of voter registration forms and allegations of voter intimidation. But more troubling for some are the suggestions that politicians, through the legislative process, are creating laws to disenfranchise certain voting groups. The accusations of legislative suppression are mostly targeted at Republicans, who are criticized by some civil rights groups for creating new laws, in particular voter identification laws, that affect mostly poor or minority voters — a demographic more inclined to vote Democrat. "When you pass a law to prevent a crime that is not occurring or that has not occurred in decades, one wonders what the purpose of the law is," Alexander Keyssar, a professor of history and social policy at Harvard Kennedy School, told CBC News. "And when you know that in fact it is likely to have the consequence of putting an obstacle in the path of a certain percentage of voters, and very disproportionately people who are poor … it makes one wonder what is going on." It's true that Republican-dominated state legislatures in some states have passed laws that could make voting more difficult. In Florida, laws were passed to limit the number of early-voting days, prohibit voting on the Sunday before the election and impose a 48-hour time limit on third-party voter groups to register new voters. These laws, critics argue, disenfranchise certain voters. For example, some black Americans, many of whom like to cast their ballots on the Sunday before the election after attending church, would lose that opportunity to vote. But the issue that has created the biggest political firestorm and accusations of voter suppression and racism by some groups are attempts to tighten voter identification laws. 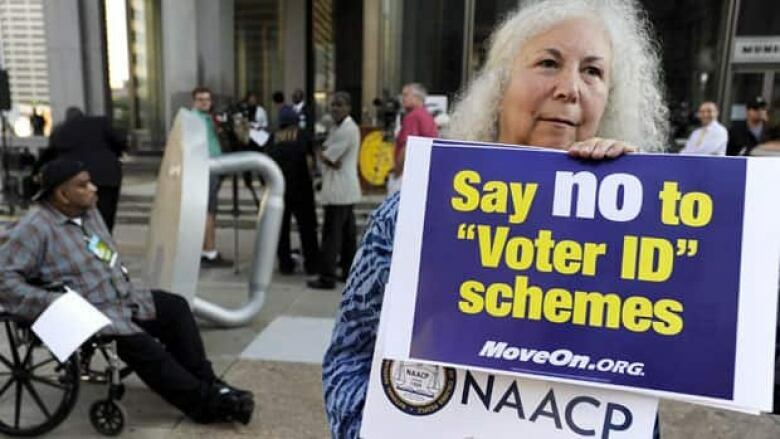 "We must overwhelm the rising tide of voting suppression with the high tide of registration and mobilization and motivation and protection," Benjamin Todd Jealous, the CEO and president of the National Association for the Advancement of Colored People, said at the NAACP's national convention earlier this year. These laws, opponents say, make it onerous for some groups to get the ID required to vote because of their financial resources and mobility issues. They also may be less likely to have driver's licences or passports and who might find it harder to miss work or lose pay to obtain proper ID. In Pennsylvania, laws there would require residents to have a birth certificate, a Social Security card and proof of residency. "In large urban areas, especially among poor people, some of them don't have the kind of ID that would be acceptable. It's not just any ID, it has to be ID that is acceptable to the state," Richard Hasen, law professor at University of California at Irvine, told CBC News. Hasen, author of The Voting Wars: From Florida 2000 to the Next Election Meltdown, said studies suggest voter ID fraud is hardly a problem. "The claims that there's a major problem of voter fraud in our elections which requires voter ID is unsupported," Hasen said. "Voter fraud is not a major problem, certainly not the kind of fraud that would be prevented by a voter ID law. "When we do have fraud in our elections, it typically involves absentee ballots, and voter ID laws don't do anything to stop absentee ballot fraud which tends to be vote buying." But Hans von Spakovsky, a senior legal fellow at the conservative Heritage Foundation, and a strong advocate for voter ID laws, told CBC News that it's still an issue that needs attention. "[The opponents'] attitude is that unless it's massive we shouldn't do anything about it," said von Spakovsky, who co-authored the book Who's Counting: How Fraudsters and Bureaucrats Put Your Vote at Risk. Von Spakovsky said, for example, there are laws against voter intimidation and that there have been only four or five cases prosecuted by the Justice Department since the establishment of the Voting Rights Act in 1965. "But that doesn't mean we don't take steps to prevent," he said. "You take basic steps to secure any kind of process, whether it's a computer network or it's the voting process." He denies trying to suppress voters of a certain demographic and pointed to Georgia and Indiana, which have had voter ID laws in place for five years. He said electoral results reveal that those laws have not depressed turnout of voters, black Americans or Democratic voters. Hasen agreed that there's been a lot of exaggeration on how much these laws will suppress the vote. "Although some Democrats would claim it would cause millions of voters to be disenfranchised, there's no proof of that. The effects seem to be much smaller," he said. He said there's maybe a one per cent shift, and that you'd have to find voters who lack ID, couldn't get it in time and actually want to vote. Most voters tend to be people who have ID, he said. As well, many of the battleground states in this election would be unaffected by the voter ID laws, he said. The courts have pushed back on much of the legislation, putting some ID laws, like those in Pennsylvania, on hold. Hasen said he believes both the Republicans and Democrats are using the issue to their advantage. "I think much of this on both sides is about getting the base excited and about fundraising."